Hopefully, if you are using Linux command line, you've heard of screen. And if you've heard of it, chances are, you're already using it. I've wrote about one usage of screen on my previous blog post, explaining how to use it to access your Raspberry Pi via serial connection. Now, we're going to see what else can be done with this useful tool. 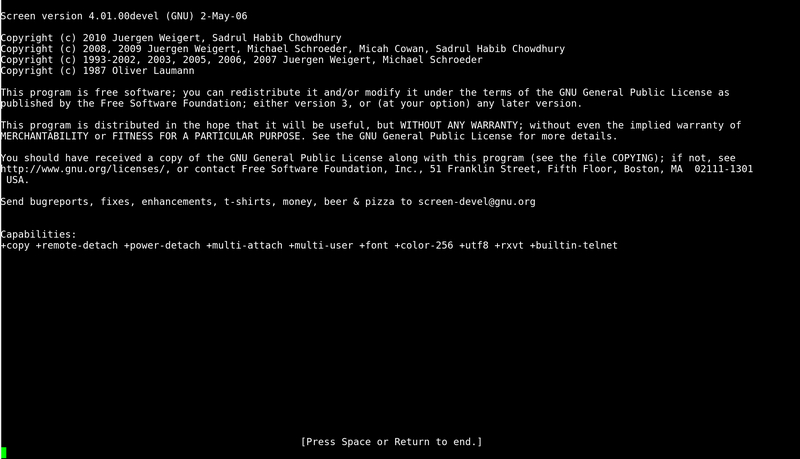 Screen is a terminal multiplexer. This means that you can start screen in one terminal and open any number of terminals inside that terminal. This lets you have several applications, like mutt, lynx, python client and a couple of spare shells, all open inside a single PuTTY/SSH connection. This is a great use of screen, but the benefits don't just end there. Thanks to screen you can run this time consuming package compilation you don't want to be interrupted in case your SSH connection gets flaky for any reason. You can just start it, exit screen and your SSH connection, and return later to see the progress. You can even run applications inside screen not having to change terminals constantly, log in and out, or to worry your X crashes. Screen is just there, as if above it all. It detaches from your actual console session. There is even more - it will auto-detach if the terminal it's in crashes or you logout. You can easily re-attach it at any time on any SSH, TTY or X session. The only major thing that will erase screen session is a reboot. Installing screen is pretty straightforward. It's already in most distribution's repositories. All in all, you know how to install things in your distribution, don't you? Naming screens is very useful, as we'll see in a while. The active window is indicated with * (asterisk). In our case, it's window #4 holding zsh shell instance. After the number goes application running within the window. The previously active window is indicated by <strong>-</strong> (hyphen). There is yet another, very useful, way to create new windows. At a command line (in any window), type <strong>screen [program_name]</strong> and a new window will be invoked, running the specified program, without the need to create another shell process. Once you finish work with an application, the screen window will be automatically closed. To navigate through windows, use [Ctrl]-a # where # is a number corresponding to screen instance you want to use. [Ctrl]-a n and [Ctrl]-a p let you cycle through the window list. [Ctrl]-a p, as you might guessed, takes you back, while [Ctrl]-a n cycles forward. One more thing: [Ctrl]-a [Ctrl]-a flips between the currently active window (marked by an asterisk) and the previously active window (marked by a hyphen). There are two ways to kill a window you no longer wish to use. First one is to use [Ctrl]-a k kill-function. The function asks for confirmation before taking effect. The other way is to simply type <strong>exit</strong> within the desired window. Again, two ways of doing so. The first one is to close all the screen windows manually with exit or kill-function. The other one is to use [Ctrl]-a \ command that will ask for confirmation to kill all windows and exit. Screen lets you to move from one terminal or machine to another and leave your session intact and programs running on the host where the session's been started. In fact, screen will detach itself automatically if you lose connection to the machine, preventing you from losing all the data. Once detached, you can reattach your session at any time and machine and pick up right where you left off. This is one of the most Ãœbercool things a screen can do. to detach and reattach the session to your new login. Screen used by John Doe on Machine. The only limitation is that you will not be able to detach screen once the session is locked. As I've said before, sometimes, for various reasons, you might want to use several screen instances. Hence, naming them on your own, instead of using full screen name is very useful. To name (or rename) an existing screen session, do <strong>[Ctrl]-a :sessionname mySessionName</strong>. Mind the colon before sessionname - it must be there. A few words of explanation. The **`-S`** switch specifies the session name you want to edit. The `<strong>-X</strong>` switch, lets you rename the session without attaching to it. This is less time consuming. Now move to the window and/or location of your choosing and insert the copied text with <strong>[Ctrl]-a ]</strong>. Sometimes a process ran within a window may give itself a longish window title, which affects it's name in screen. You may also want to give windows unique names for your own convenience. This can be done with key combination <strong>C-a A</strong>. Once invoked, you'll be prompted for the new title. At some point, especially if you've never used `screen` before, you might get lost within screen windows. For this, we can modify `screen` configuration file to show **hardstatus line** within our `screen`. This is one of the most useful features on screen and when customised properly, it really simplifies your work. It can list your current terminal, all open terminals, your system time clock, your hostname and more. Below you'll find a simple hardstatus line that I use on my system. There are two types of screen configuration files (as it is with most Linux programs). The main configuration file sits at **`/usr/local/etc/screenrc`** (on some systems it's **`/etc/screenrc`**). It holds all the defaults for all users on the system, thus it's not advisable to edit it, as once a change is done, especially one which you cannot locate, every user will have the same problem. This is why every user can create their own configuration file for an application, that sits in their home directory. Instead of configuring screen on the fly using the <span style="color: #800000;">[<span style="color: #800000;"><strong>colon</strong> command</span>](https://www.gnu.org/software/screen/manual/screen.html#Colon "screen colon")</span>, you can place all your bindings in that file. You can use the default configuration file as a guide, as it contains a number of useful examples for various commands. You can set in the file just about anything, from key bindings to default programs that you want to run on startup. It's all up to you. If you need more help on the use of screen, head to the documentation page: <span style="color: #800000;">**[<span style="color: #800000;">Screen User's Manual</span>](https://www.gnu.org/software/screen/manual/screen.html "Screen User's Manual")**</span>. <table><tbody><tr><th>Keystrokes</th><th>C-a : Command</th><th>Action</th></tr><tr><td>Ctrl-a 0</td><td>select 0</td><td>Switch to window 0</td></tr><tr><td>Ctrl-a 9</td><td>select 9</td><td>Switch to window 9</td></tr><tr><td>Ctrl-a Ctrl-a</td><td>other</td><td>Toggle to the window displayed previously.</td></tr><tr><td>Ctrl-a a</td><td>meta</td><td>Send the command character (C-a) to window. See escape command.</td></tr><tr><td>Ctrl-a A</td><td>title</td><td>Allow the user to enter a name for the current window.</td></tr><tr><td>Ctrl-a c</td><td>screen</td><td>Create a new window with a shell and switch to that window.</td></tr><tr><td>Ctrl-a Ctrl-c</td><td>screen</td><td>Create a new window with a shell and switch to that window.</td></tr><tr><td>Ctrl-a C</td><td>clear</td><td>Clear the screen.</td></tr><tr><td>Ctrl-a d</td><td>detach</td><td>Detach screen from this terminal.</td></tr><tr><td>Ctrl-a Ctrl-d</td><td>detach</td><td>Detach screen from this terminal.</td></tr><tr><td>Ctrl-a D D</td><td>pow_detach</td><td>Detach and logout.</td></tr><tr><td>Ctrl-a k</td><td>kill</td><td>Destroy current window.</td></tr><tr><td>Ctrl-a Ctrl-k</td><td>kill</td><td>Destroy current window.</td></tr><tr><td>Ctrl-a Space</td><td>next</td><td>Switch to the next window.</td></tr><tr><td>Ctrl-a n</td><td>next</td><td>Switch to the next window.</td></tr><tr><td>Ctrl-a Ctrl-n</td><td>next</td><td>Switch to the next window.</td></tr><tr><td>Ctrl-a x</td><td>lockscreen</td><td>Lock this terminal.</td></tr><tr><td>Ctrl-a Ctrl-x</td><td>lockscreen</td><td>Lock this terminal.</td></tr><tr><td>Ctrl-a w</td><td>windows</td><td>Show a list of window.</td></tr><tr><td>Ctrl-a Ctrl-w</td><td>windows</td><td>Show a list of window.</td></tr><tr><td>Ctrl-a ?</td><td>help</td><td>Show key bindings.</td></tr></tbody></table>Take a moment to look over those commands. They should tell you how to basically operate screen, especially the last one. There are plenty more, use **`[Ctrl]-a c`** and then type <strong>man screen</strong> for the full list.